Note: “Post to Diigo” is for easy posting. 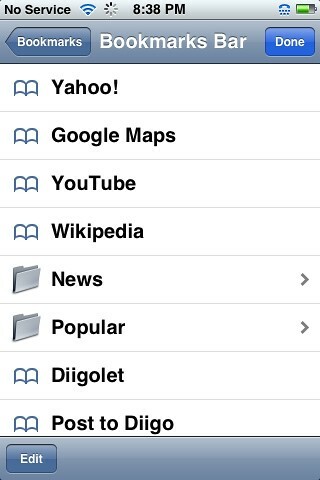 “Diigolet” has the advantage of not jumping to another page, although other functions not working. The choice is yours. 2. Sync bookmarks with your iPhone. Follow the instruction by Apple: http://support.apple.com/kb/HT1386 If you experience problem in this step, try to remove all your bookmarks on iPhone, then, sync again. Give it a try and let us know what you think. There are a lot of new innovations on iPhone / mobile apps. We’re continuing to push the envelop & cool new apps on their way… We’d also love to hear from you – drop us an email info [at] diigo to discuss your feedback / wishlist! Now, on your iPhone, add the page that just failed to load to your bookmarks. Save and go to a page you want posted to Diigo. Open your bookmarks and select the new bookmark you just made. Click the link above from within your iPhone safari browser. Remove everything preceding the ? (question mark) *and the question mark itself*. Don’t worry. We’ll get through this. I do not want to sync my bookmarks. I have different bookmarks on my iPhone than my computers, but there are occasions where I want to add a site I found on my iPhone to my computers. I was hoping I could get around the email link option on my iPhone and use Diigo.com instead. Not possible…? I am very new to this bookmarking and just got an iPhone. Great info I think I am getting the hang of this now. 1. From iPhone: press and hold the post to Diigo link above to open it in a new page. It will fail, but go ahead and add it as a bookmark. 2. Edit the bookmark removing everything before, and including the question mark. 3. Rather than using the m.diigo.com site I use rss. Go to diigo.com/user/yourusername (no ‘m.’). Click on a tag. In the upper righthand corner click the orange rss button. This will load your bookmarks for that tag as a rss feed page. Bookmark it, and repeat for each desired tag.